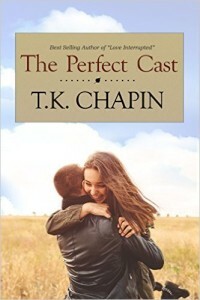 The Perfect Cast by TK Chapin is another wonderful faith filled offering. I always know that a novel by TK Chapin will not disappoint, his stories are always a compulsive read with God at the centre. TK Chapin’s faith and belief in God shine through his writings, which are never ‘preachy’ but are designed to make you think about God. At the heart of The Perfect Cast is Roy, the grandpa to Jess and Henry, who is a very godly man. Jess and Henry spend the summer on Roy’s farm. It is to be a summer that will impact and change their lives forever. Not all the characters are Christians in the novel. Some even go to church but have never really had a relationship with Christ. Others, like Levi, the young man who helps out on Roy’s farm, do not go to church, but have big questions about God. The reader too, might share these questions, and will hopefully find their own answers within the pages of the book. The Perfect Cast shows that being a Christian does not guarantee the perfect life free from heartache. Christians have health issues, disappointments and problems but a faith in God helps to cope at these times. Faith in God does not mean that Christians will never be angry with God over life events. However after they have taken their anger to God, they will also take their prayers to Him. God is our Father, and as such we all need to be real with Him, as the character of Roy demonstrates in the novel. The Perfect Cast deals with the theme of Family. Families can be loving, and they can be messy. Ultimately families stick together to protect one another, as demonstrated by Tiffany who is Jess and Henry’s mother, and also by Roy. The love of the family can extend beyond its blood members – Levi and Roy clearly have a bond that goes beyond a working relationship. The Perfect Cast is a novel about growing up and awakenings. Jess has put her father Brandon on a pedestal, and labelled her mother as a villain – but a summer on the farm will open her eyes to some truths that need to be faced. No one is completely ‘good’ or completely ‘bad’. It is also a summer for sorting out ones priorities, and deciding where ones dreams and futures lie. The Perfect Cast is a rich novel, so much more than just a pleasant read. There are complex relationships, there are highs, there are lows, but over it all there is God. Download or buy a copy of The Perfect Cast today, you will not be disappointed. You will have a great read, and may even be strengthened in your faith.